With a client–we were both tickled by our matching outfits. I’m often questioned about why I work exclusively with seniors. Many Daily Money Managers work for busy professionals, small business owners, military personnel, and frequent travelers (and you can read more about the field of Daily Money Management at www.AADMM.com). The work they do is invaluable, but it is not what interested me. In 2011, I was a budding entrepreneur with a desire to help seniors when I discovered the field of Daily Money Management. The mix of advocacy, organized financial know-how, solid reliability, constant communication, commitment to professional ethics, and the ability to create deep rapport with clients that is required to be a good Daily Money Manager matched my skills and abilities. 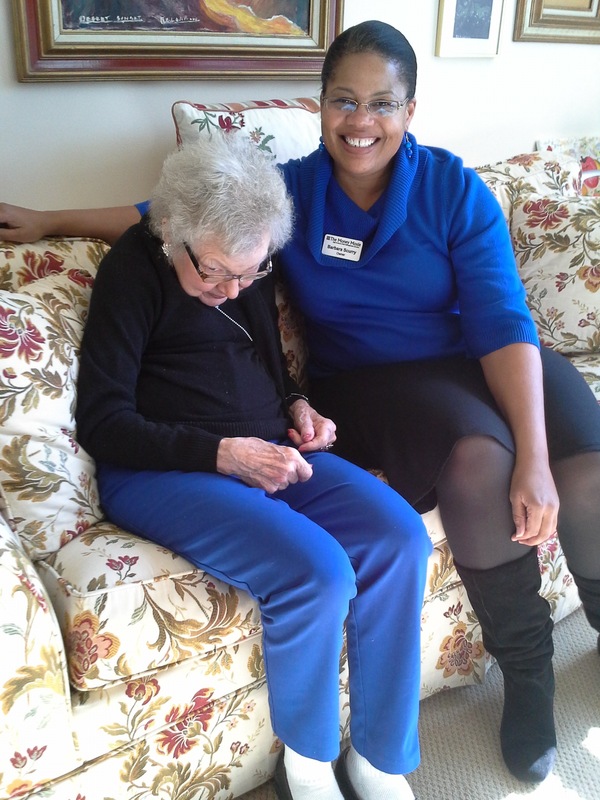 I quickly realized that this career could be my way of connecting and advocating for seniors in deep and impactful ways. Should they move into independent living or assisted living? How does skilled nursing work? Medicare pays for it, right? What options exist to meet the needs of someone with declining health? What’s the difference between home care and home health care services, and who pays for it? How do older folks live their best lives on their own terms? Being on that journey with individuals and families, advising them of options and helping them navigate the complex world of elder care, invigorated me. I was really helping and making a positive difference in people’s lives! When I left the CCRC, I wanted to do more of that but in a way that included my financial experience. So starting a daily money management company that focused on seniors and utilized my knowledge of the elder care world was my best match. On a very personal level, my company also feeds my soul. As a secondary gain of doing something that I enjoy and that I’m good at, I get to create and nurture wonderful relationships with folks that become as special to me as grandparents. Unfortunately, I never had the opportunity to be close to my own grandparents. Due to family issues, my paternal grandparents were geographically distant and my maternal grandparents were emotionally distant. Working with seniors allows me the chance to fill a void that I didn’t even realize was there. I care and provide for each of my clients as I would require any care professional to treat my own family. My whole heart goes into this work, so each of my clients get a lot more than just a smart lady to pay their bills and sort their mail. If you’re interested in learning more about how to become one of my clients, please schedule a free, no-obligation phone consultation with me here.